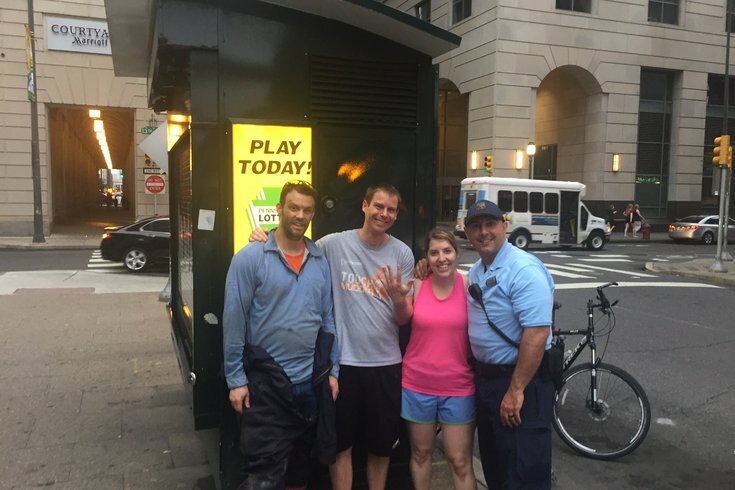 After a wedding ring fell through a Center City sidewalk grate, PECO employee Brian Naughton (left) saved the day. Erin and Steve Brown have been married for a year-and-a-half. To celebrate their union, Steve wore his grandfather's wedding ring. It's a family heirloom engraved with his grandparents' initials and wedding date. Then came Friday night, when he thought he might have lost it forever. Steve was downtown to have dinner with a friend visiting from out of town. As he walked along Filbert Street, between 12th and 13th in Center City, he removed his hand from his pocket. That's when things went awry, according to a nine-tweet thread that Erin shared with the world. 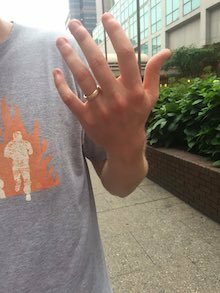 "My husband's wedding ring flew off of his hand and rolled away and down a Philly sidewalk grate," she wrote. As any married person knows, this is not the ideal scenario. Sure, Steve had told Erin days earlier that his ring "felt really loose," but that in no way served as a precursor for what the couple would have to do to retrieve it. Erin was kind enough to give PhillyVoice a call on Monday afternoon to break down the situation leading up to a happy conclusion. Since it was rather dark on Friday night, when Steve texted Erin to let him know what had happened, the couple from Plymouth Meeting, Montgomery County regrouped and strategized. "We wouldn't have been upset if it was just a regular wedding ring. We could've gone out and gotten another one," she said. "But since it was an heirloom with so much sentimental value, Steve was beating himself up over it." Steve Brown was reunited with his wedding ring on Saturday. They returned to Center City around 2:30 p.m. Saturday for a fishing expedition. "About a half hour in, the skies opened up. It was pouring rain," she said. "I never thought I'd be there lying on a grate on the sidewalk." Soon, hope would arise and then disappear. Their multi-hour effort attracted quite a bit of attention from passersby and cab drivers awaiting fares outside the Philadelphia Marriott Downtown hotel. "One man from Chicago approached and asked if we minded if he prayed for us," Erin recalled, adding that they didn't mind, and pray he did. Soon, a Philadelphia police officer named Danny Leone walked by. They told him what had happened and he suggested contacting the Fire Department to help open the grate. "Brian was down there for a half-hour, 45 minutes looking," Erin said. "Thanks to his flashlight, I was able to see it. I yelled down that 'it's right in front of your foot.'" When Naughton emerged from underground holding Steve's ring around 7 p.m., he was met by the cheers of an appreciative crowd. What could have been an "incredibly sad and disappointing day" was anything but. Erin was asked to share the moral of the story. "Have faith in people. We've gotten some oddball comments as expected, but there were strangers in their work clothes laying on the ground trying to help us," she said. "One woman there told her it was the most exciting thing that happened to her that day." As for the ring, it's been taken to a jeweler at the King of Prussia Mall, where the resizing process (from 8.25 to 8) will hopefully ensure that it doesn't slip off Steve's finger again.